New sponsor - La Sportiva! Completing my hard yellow circuit on the board for the first time yesterday. A small training milestone for the summer. If you would like to join me for some coaching at my own wall, I just announced some dates for coaching in December, and then in February. The details are here. As the wet summer continues, my plans of mountain trad projects continue to wait in limbo and my body is broken on a daily basis with tough training. This is all good, I am fit! I've also used the time to tie up some other skills I've wanted to learn and am now a qualified drone pilot! 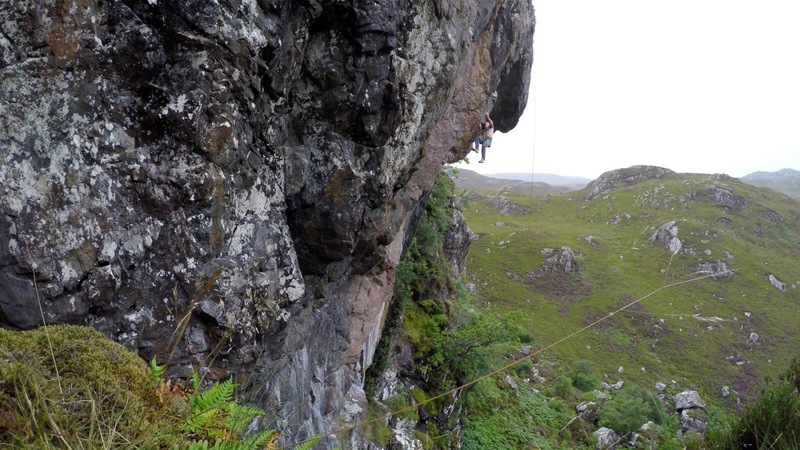 I got a day in Binnien Shuas and revisited a potential project I tried to abseil down about 5 years ago but gave up on. I say tried to abseil down - the line goes through a huge barrel shaped too system, and I couldn’t get any gear in to pull myself into the wall and get a look at it. Now armed with better aiding skills and kit, I managed fine this time and cleaned it up. It looks around 8a with fantastic moves and a thank-god cam near the crux, although the crux will be placing the cam and managing to keep going! I was hoping to get in there today for a lead, but it was rain 15, dave 0. Meanwhile, back in the wall where I have been racking up the circuits each day, I have been making some progress, It’s always hard to tell how much progress, since I have not had a rest day in some time, but you get clues. The clues seem promising but not mind-blowing. The main issue has been the need to eat some carbs to fuel the anaerobic sessions. My body does not get on well with this and so I’ve been working hard to arrive at a strategy to keep these to an absolute minimum required for specific sessions. Manipulating the amounts and timing has been tricky and the trial and error process has contained a lot of error! I’ll get it right yet though and I continue to learn much about this, and about how my body responds to different regimens. 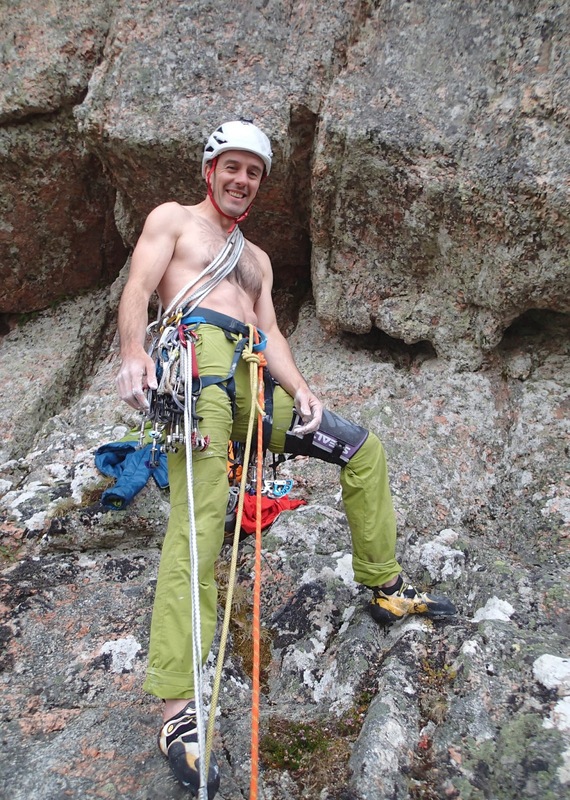 Eating in my own personalised formulation of a ketogenic diet while I was only bouldering was both highly effective and very easy for me (once I had learned quite a lot of prerequisite knowledge and corrected various early mistakes). I know many people don’t get on well with it. My hunch is that this is down to lack of knowledge or planning in many cases rather than inherent unsuitability of the strategy. Managing inclusion of some CHO in the diet for CHO-based anaerobic training is probably very easy for some, but not for me, and even small amounts kicks on many of the problems that led me to the ketogenic diet in the first place. I did wonder whether maintaining this style of eating would actually be the better end of the trade off for me for sport climbing too. At the moment, it looks like the optimal route for me will be some sort of periodised balance between minimal carbs during anaerobic sessions and moving back into ketosis as quickly as possible at other times could be the best. I emphasise ‘could be’ - I am not yet sure. What the optimal regimen will look like I’m not sure either. I am sure that it will take fairly meticulous planning though. The trouble with experiments of any kind in sports science, especially when they include both training changes and nutrition is that so many variables are moving at the same time. Attributing an effect, positive or negative, to one change is an exercise in something between futility and careful guesswork. Was it the sleep, the protein, the fat, the carbs, the type of food, the training, the conditions, your mental state or a whole host of things you hadn’t even thought of that were responsible for what you observe? Overall, it’s fair to say I have stepped up my game in all aspects of the organisation of my training though. One thing can always throw a spanner in the works regarding training is life outside of climbing. I’ve had a couple of ups and downs outside of climbing lately. Being totally honest, I’ve stopped a couple of training sessions after warming up purely because I wasn’t in the right frame of mind to train (putting it mildly). Sometimes training can actually be an outlet for difficulties in ‘real’ life. In fact I’d say climbing has been utterly essential in getting me through some tough times. Sometimes though, I’ve just not been able to do it. As the wet summer continues, my plans of mountain trad projects continue to wait in limbo and my body is broken on a daily basis with tough training. This is all good, I am fit! I got a day in Binnien Shuas and revisited a potential project I tried to abseil down about 5 years ago but gave up on. I say tried to abseil down - the line goes through a huge barrel shaped too system, and I couldn’t get any gear in to pull myself into the wall and get a look at it. Now armed with better aiding skills and kit, I managed fine this time and cleaned it up. It looks around 8a with fantastic moves and a thank-god cam near the crux, although the crux will be placing the cam and managing to keep going! Mid crux on The Inconvenient Tooth E8 6c. Thanks to Cubby Images for these great pics. During the good spell back in June, Dan McManus and Ross McKerchar climbed a great looking new E8 8c new routes the arete of the Bhasteir Tooth on Skye. I had never been up there but obviously knew the arete had not been climbed. I always wondered if the roofs would either have any holds on them, or be escapable onto the side walls, so I never went up to look. As it turned out, the side wall gave an E8 - all good! So I was obviously keen to go up and repeat it. After going up with Calum last weekend and diverting to Algol in the drizzle, I had to return home for a couple of days work. 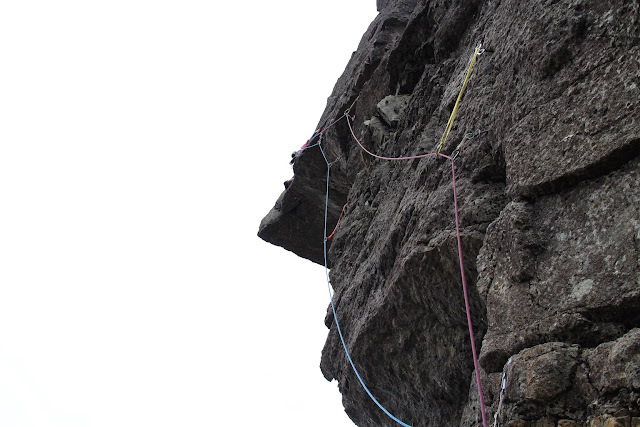 Calum was working on Skye and managed to squeeze in a repeat of the route on the Thursday. I walked in with Iain Small and Cubby on Friday (my first opportunity) on a forecast of rain arriving around mid afternoon. However, as we dropped our sacks at the foot of the route, it started to spit with rain. 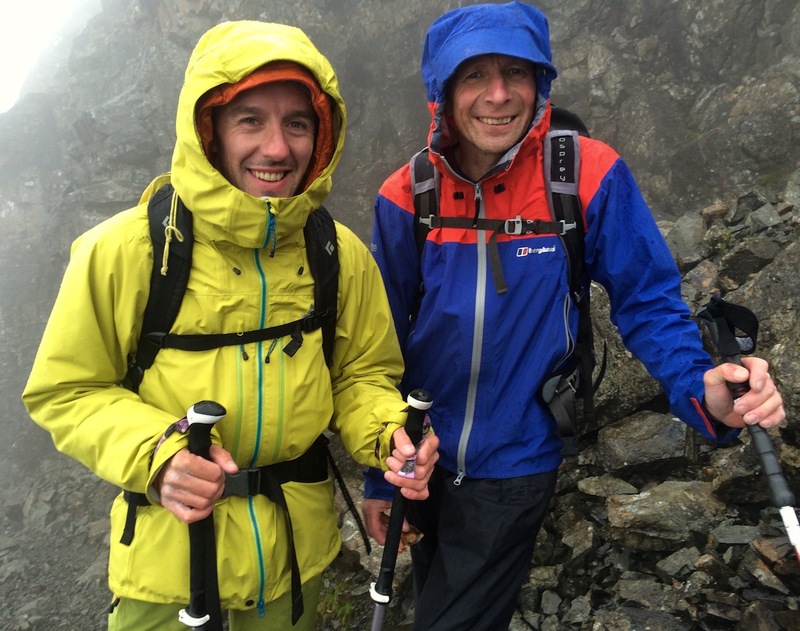 We both quickly went up the scramble route to the top of the tooth and abseiled down to check the gear and I hurriedly tied in with the rain still spitting, but only slightly. I expected it to get wet quickly, but moved as fast as I could to arrange the gear in case I could do it just in time. The crux was fine - easier than I expected and in no time I was on the easier upper arete which I took my time on since I would certainly not have another chance! I abseiled and stripped it as fast as I could and Iain tied in. The spits were gradually becoming just rain and it wasn’t clear that Iain would have time to do it. Iain just after the crux. 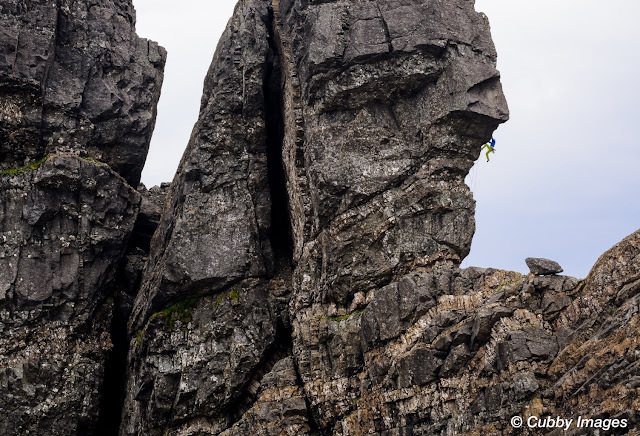 With a shout he powered through the crux and as the rock started to get a little wet he moved round out of sight and up the final arete. The clouds got thicker and the rain got heavier and drips started to run off the faces that were catching the strengthening wind. Iain moved quickly and then stopped. But impressively, after a couple of minutes contemplation, he continued upward on the final metres of E3 terrain with was by now fairly wet. Winter climbing experience no doubt paid off! We packed up soaking wet ropes and trudged back down feeling lucky to have made the best of every second of available dryness that day. I reflected that we could easily have not climbed it, all it would have taken would have been a pulse of slightly heavier drizzle before we started climbing. If we’d trudged down soaking wet without the tick, I’d no doubt have felt rather differently about the day, and perhaps about the merit of taking our chances on a poor forecast. The rapidly worsening weather situation as Iain was climbing the upper arete. As always with living in Scotland, the wet spells like we’ve had this summer seem to go on and on while you’re in them, but they are quickly forgotten when the conditions turn good and you can have your pick of routes to do. 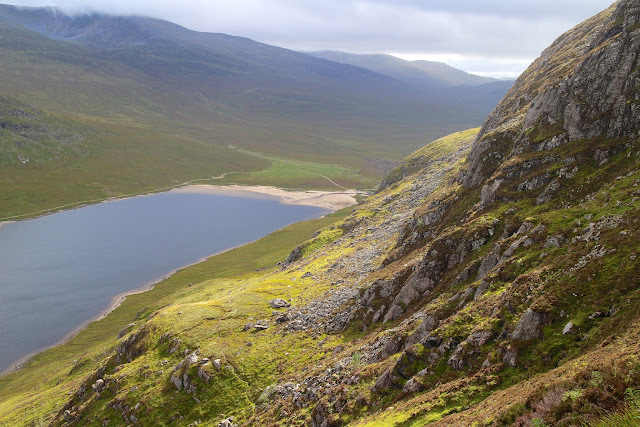 Despite the recent rain, I am gradually working through my list of routes to climb for the summer, although my Ben Nevis projects are looking a bit remote now. Unless we have a September like last year! 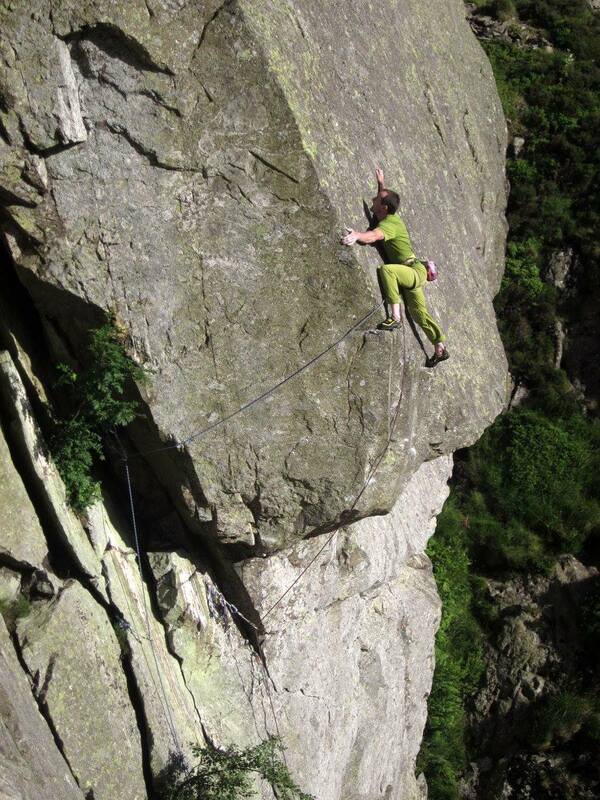 Sunnier times back in June - Rich Mayfield just sent me this pic of me repeating The Keswickian E8 7a in the Lakes. Oh for some more sunny days like that! 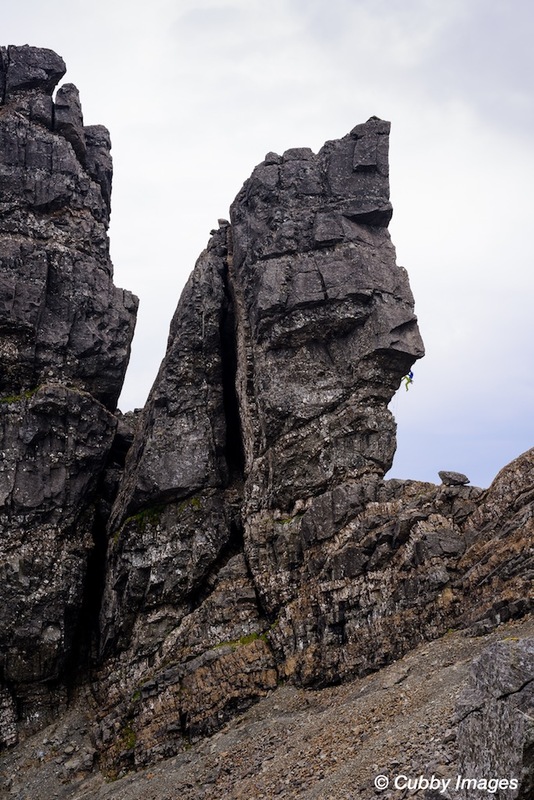 Calum Muskett entering the crux of Rapid Learning Curve E6 6b, Elgol, Isle of Skye. In my last post I mentioned that I’d spent a fair bit of time on my board in the past few (wet) weeks and had prepared myself a detailed training program to prepare for the autumn’s sport climbing challenges. With a break in the weather forecast, I met up with Calum and Gabby and we headed for Skye to try and climb something in the Cuillin. 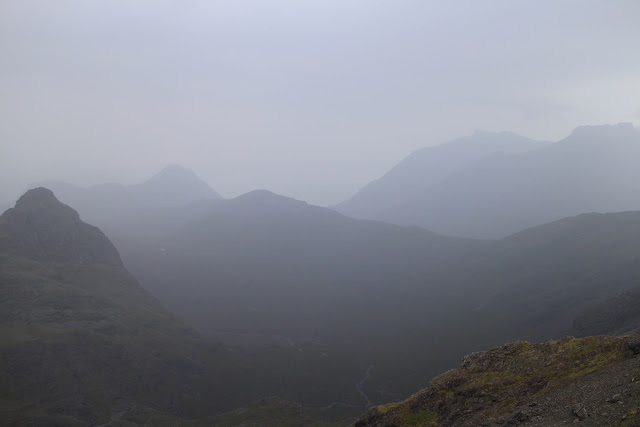 As is the theme for this summer we were met with drizzle and mist on the drive over Glen Shiel and onto the island. What a surprise. After tea and regroup in Broadford we diverted to Elgol and saw off the two E6s there, Rapid Learning Curve and Hovis. After doing these the midge defeated us. It was good to climb some actual rock but after driving home to Roy Bridge I couldn’t wait to try out my new campus rungs I’d spent the previous day making. I had needed to take a couple of rest days from training as my Brachioradialis was complaining from rather relentless dead hanging routines. So as well as the usual ton of work to be done I took a bit of time to make a proper system/campus setup on my 45 and 15 degree boards. Foot-on campus style anaerobic intervals is never something I’ve really tried, probably because I’ve never properly trained endurance before! That might sound silly but it’s actually true. 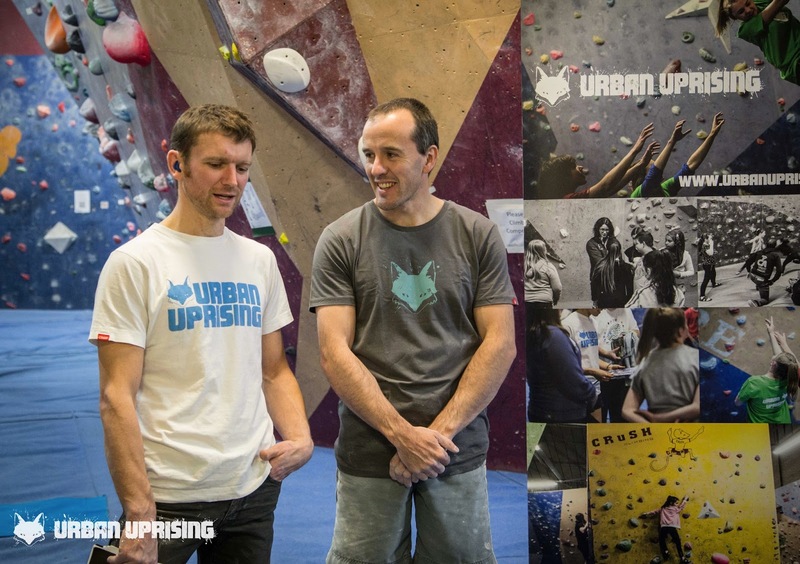 I’ve nearly always spent 60-80% of my time just going climbing outside year round, and in the periods where I’ve done more sustained stints of climbing indoors, it’s normally just basic strength and bouldering, with a bit of normal board endurance circuits of 30 moves upward. Even the start I’ve made in the past couple of weeks of doing more regular endurance work has made a bit of an impact. It’s a nice feeling and its definitely spurred me on to enjoy the program I’ve set through to the end of October. I’ll keep the blog updated with progress and lessons learned along the way. I did have some resin system blocks on my board already, but I did find them a bit harsh on the skin and didn’t end up using them that much, except for tooling at the start of last winter for a few weeks. It was on my to do list to replace the whole setup with quite positive but still fingery campus rungs that would be super skin friendly for maximum anaerobic burn and minimum skin pain. I’m hoping that if I use them in combination with my cadre of ‘real’ climbing circuits, they will come into their own, both for the intensity and the skin friendliness, since I have only a handful of rest days each month now. I’m still finding looking over my program a little scary at the same time as being exciting. My campus rungs, about 40cm apart, with pinch blocks below (desperate for my weak grip!) and big holes for tooling in when December comes around. Not bad for an afternoon’s work. I’m actually still not totally finished the plan either. I’m still trying to pin down the nutrition side of it, which is predictably taking a lot of work. And I don’t always feel like I’m getting closer to settled decisions. I say ‘decisions’ rather than ‘answers’ since there are very few solid answers in sports nutrition. The more solid others claim to have answers on sports nutrition, the less I trust them. So my work in progress nutrition plan contains many calculated gambles. Seeing if they work out will be a fun and fascinating exercise which will include eating a lot of really good food! I’m particularly proud of my workout drink schedule at the moment. 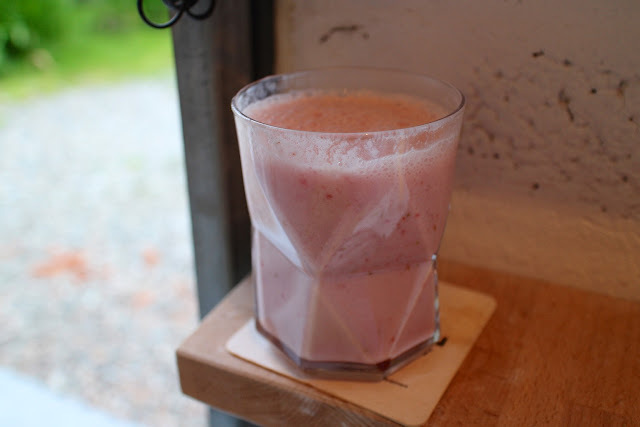 Fresh strawberries and milk, blended up. Not a bad delivery vehicle for my EAAs and circuit carbs. During July I was mostly to be found here in my wall, running many a lap. After a successful couple of days in Early June visiting the lake and climbing Return of the King (E9), I returned for another quick trip of three days. On the first day I made the most of the uninspiring weather and repeated The Keswickian (E8 7a) in a couple of hours work. Unfortunately I was rained off the other two days. 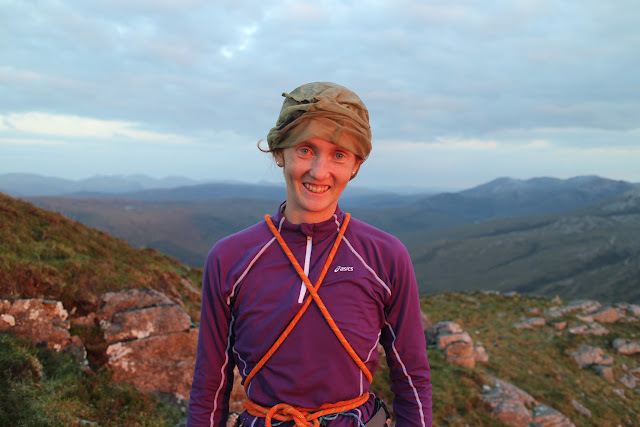 I decided not to go on an alpine big wall trip this summer and instead stay in Scotland to try and climb some of the great mountain trad projects I have here, especially on Ben Nevis, where I have not climbed on in summer since I did Echo Wall way back in 2008! Unfortunately, I have picked the wrong summer, and my gamble has not paid off. The last part of June and all of July has been very wet and poor and I’ve not been able to get on the projects in the west. Never mind - I’m used to being adaptable and trying to make the best of the situation to get ahead for the next goal. On my horizon is the sport climbing season in the late autumn. I always like to set myself various all-rounds challenges that are fun to try and focus my energies. After last winter’s successful focus on bouldering, I wondered if I could climb an 8C boulder, 9a sport route and a really hard Scottish mixed route in one year. I’m not at all confident I can do it (no climber ever has, to my knowledge), which is the point - I want to push well out of my comfort zone. With the 8C boulder ticked, next up I would like to climb a long endurance 9a, probably in Spain, if I can turn myself into an endurance climber quickly enough. I know I’ll have to train in a very organised way to manage this, so I have written myself a very detailed training program. Although I’ve done this many times for other climbers, I’ve generally trained myself on a flexible basis because I’ve focused on going outside climbing whenever the weather is good as my first priority, and just fitted in training whenever it rains. This can work well up to a certain level and is a good option if you are able to keep a good working record of your training load and priorities. Not many people can/do. Perhaps the awful weather in July has galvanised me to take a more long term view focused on the trip. Not to mention the success I had with doing my winter goal of climbing an 8C boulder with this approach. During July itself, I trained most days on my board, building a base of endurance and general conditioning, on which to build upon during September and October. 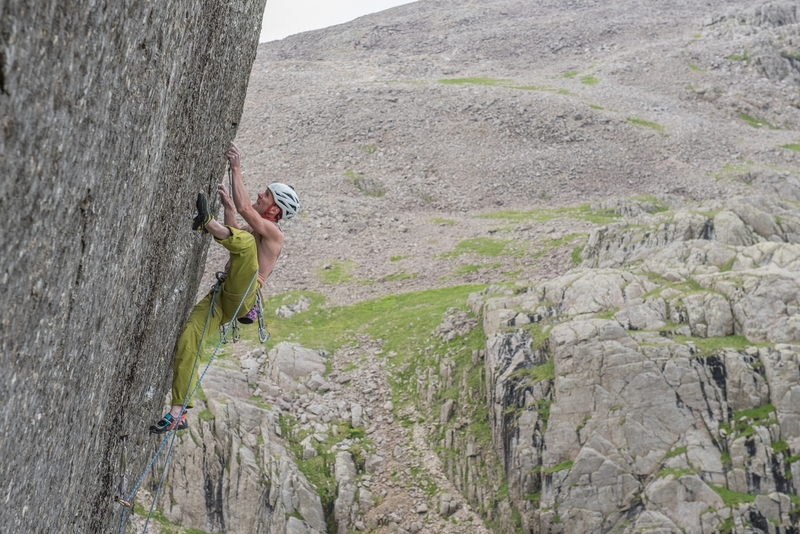 Full stretch on the reach crux of Nuclear Nightmare 8a+ on Creag Nan Cadhag near Gairloch. I’ve snatched the rare dry days in the west of Scotland to tick off some of the harder sport routes in the north west. First, Remember to Roll (8b) and Stalks 8a+ Creag nan Luch. 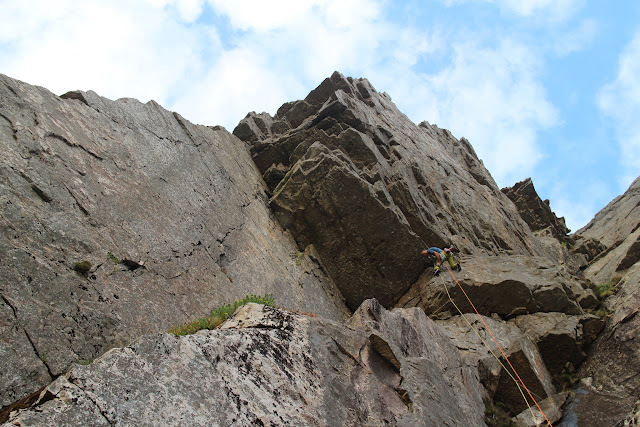 In the past week I had a couple of days at Creag nan Cadhag and ticked off Game Over (8a+) and Nuclear Nightmare (8a+) as well as flashes of the other 7cs on the wall. 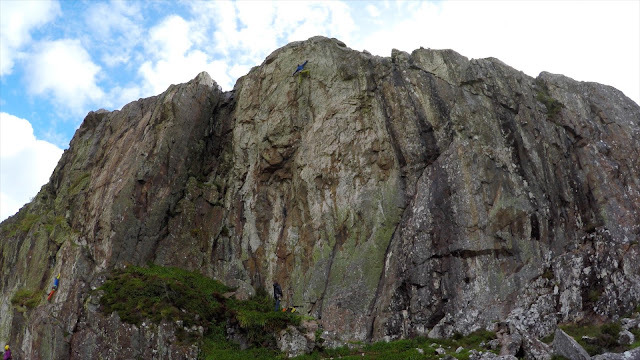 All great routes and great to be able to just turn up and climb sport routes in Scotland without having to equip and clean them first! Kudos to the equippers. I can definitely feel my month of base training has done something and I have made some progress already. Looking at my training program is slightly terrifying though. I’ll just have to see if I have judged the training and recovery correctly. Already I am running into some issues; my right brachioradialis is complaining a little. I do get some aches here on and off, maybe every couple of years, and usually it passes if I take my recovery seriously and make sure I complete my antagonist workouts. Ongoing monitoring and adjustment is essential for any training program, since life never works out as planned. I’ve planned the training as far as my sport climbing trip in November, and have a first crack at some hard routes then. If I get on well, I’ll switch straight onto tool training for the mixed season. It seems so far away, but it’s not. On with the training! 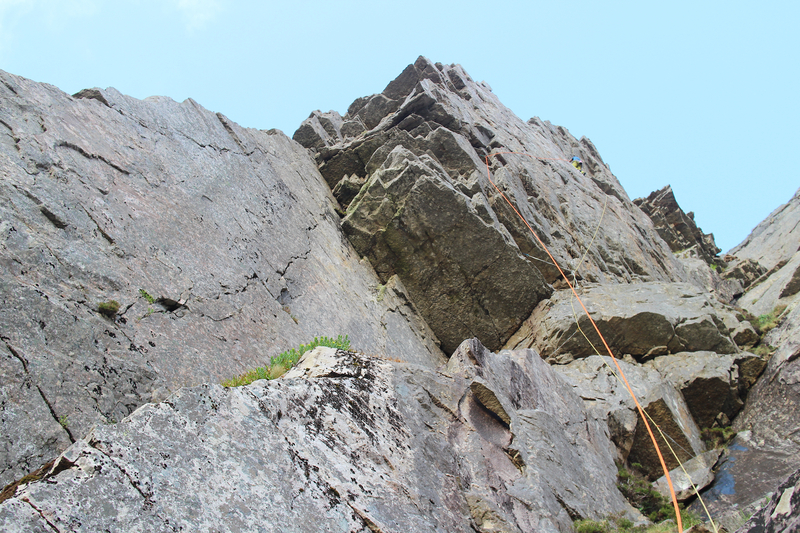 Climbing Stalks 8a+ on Creag nan Luch. I also climbed Remember to Roll 8b just to the right, back in June. 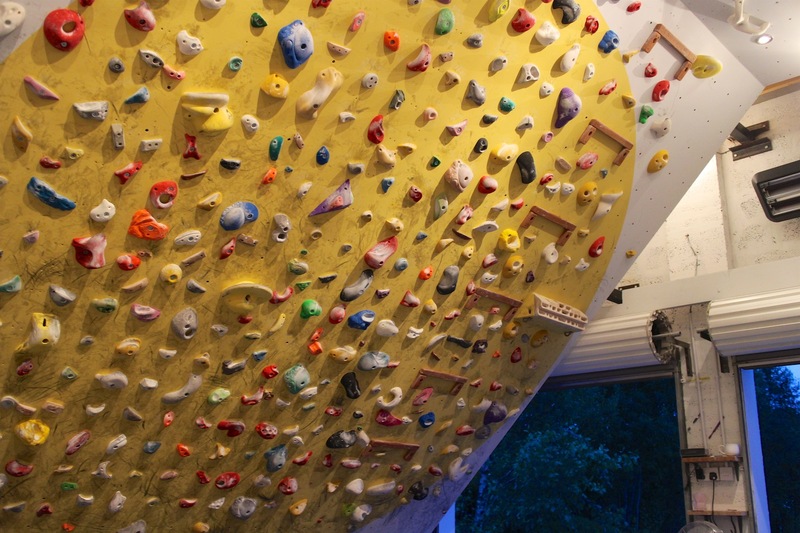 Both fantastic routes which can be climbed in the rain. 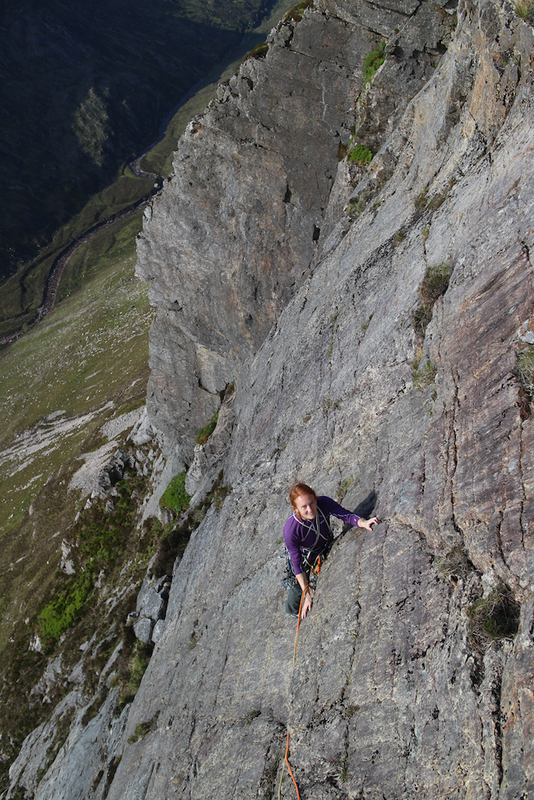 Blair Fyffe on Whip and Ride, 7c, on Creag Nan Luch. I managed to get the flash of this great route shortly afterwards. A Fine Line from Nevis Landscape Partnership on Vimeo. Here is a wee film I made recently with Michael Tweedley and my DJI Inspire 1 drone, running the always fantastic Tower Ridge on Ben Nevis and the excellent paths around the mountain. 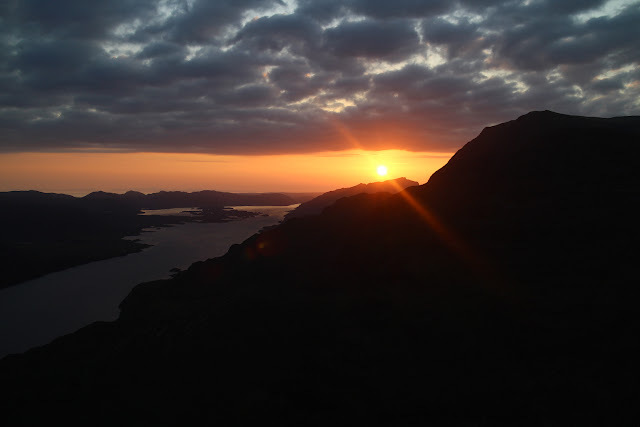 I made the film to help draw attention to the great work of the Nevis Landscape Partnership and Friends of Nevis in building and maintaining the paths in the Nevis area, alongside other organisations such as the John Muir Trust. When I think back to the Allt a Mhuillin path as just one example, it’s in so much better shape that it used to be. Most grateful to the teams, especially the volunteers who build them. Please do volunteer and help - the days out are always good craic. HELP WANTED! from Nevis Landscape Partnership on Vimeo. GoPro of Return of the King E9 6c from Dave MacLeod on Vimeo. 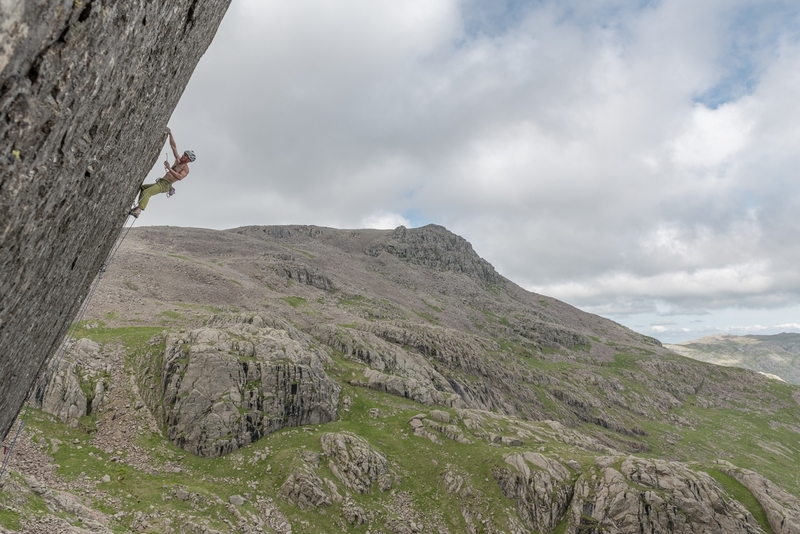 Here is some GoPro footage of my ascent of Return of the King E9 in the Lakes last week. You can hear Steve Ashworth’s camera snapping away just behind the camera. But I didn’t notice any of that where I was, not that I would anyway in a bubble of climbing psyche. 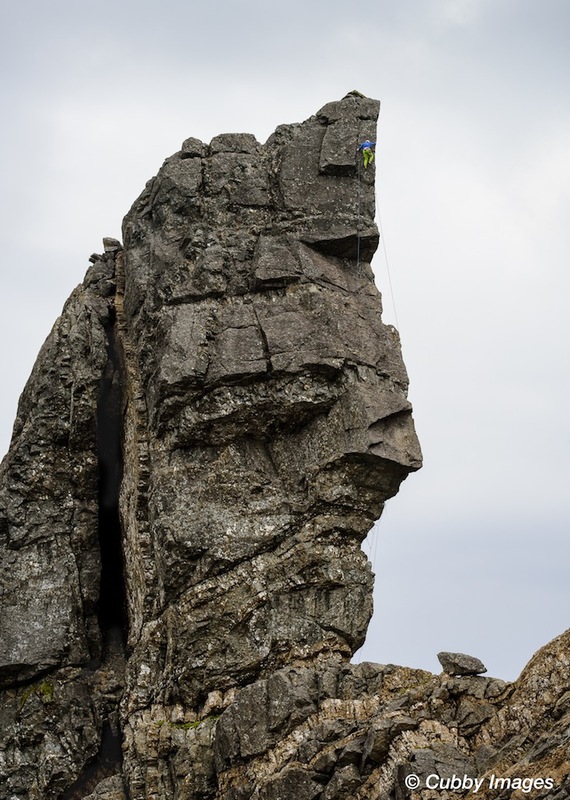 Actually when I was practising the route right before the lead, I did notice a lady on the path below look up and notice be dangling about on the wall and shout ‘Oh my god’ in a very loud voice. It reminded me a bit of climbing at Dumbarton back in the day. I’m not used to climbing in such busy places! 3WM June 2016 White circuit from Dave MacLeod on Vimeo. 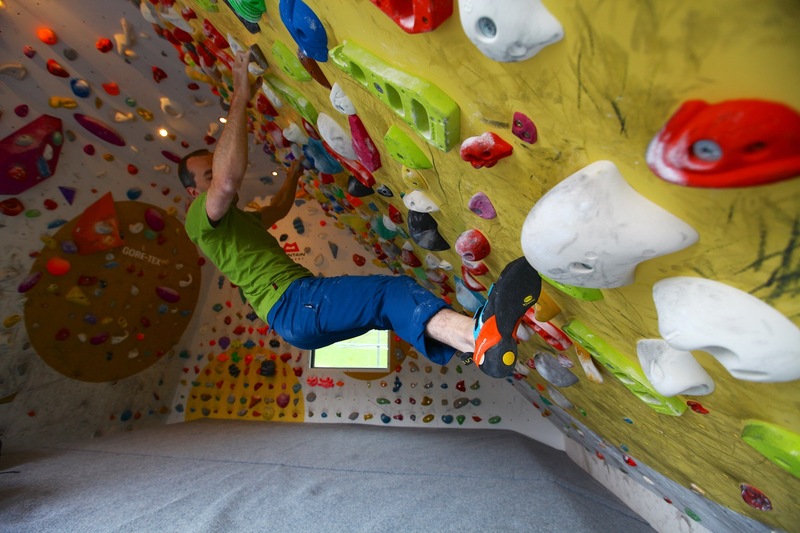 Yesterday I set a new white circuit (the hardest in the range of boulder circuits) in Three Wise Monkeys in Fort William. Most of them are pretty steady in the V6/7 range. The easiest are roughly V5 and the hardest one maybe V8+ (the left hand death star one). If you would like the beta, is some GoPro footage of all of them. Enjoy them Lochaber climbers and visitors! Great to be in there setting new boulders while the rain falls outside. 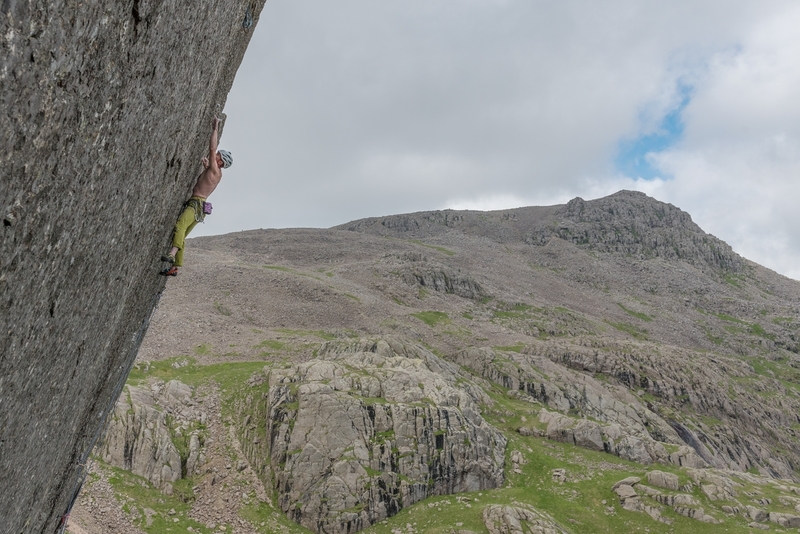 Over the years I’ve repeated several of Dave Birkett’s excellent hard trad routes in the Lake District - If Six Was Nine (E9), Caution (E8), Impact Day (E8) Dawes Rides a Shovelhead (E8) and John Dunne’s route Breathless (E9). But I’d never got myself up to Scafell where Birkett left a trio of E9s that looked fantastic. To me, Return of the King looked the most appealing line to try first. Last Tuesday I headed down and drove round to Wasdale for the first time. Lovely place! Having observed lots of ‘Vote Leave’ and UKIP banners in many of the Cumbrian villages on the drive round from Keswick, and having overheard several conversations in cafes and shops en route, I walked in with a head full of contemplation about the UK and its future, which at the time I still hoped would be to choose to stay in Europe. With the realisation that the bubble of ‘remain’ support I came from in Scotland was evidently not widely shared in the north of England, the enormity of the week and the prospects for my daughter’s life began to dawn on me. So my first session on Return of the King was a little distracted. Nevertheless, I enjoyed myself. I sussed out the line, give it a quick clean and top roped it first try after trying the moves once. I was aware that both the previous ascents used preplaced gear and I could see why! 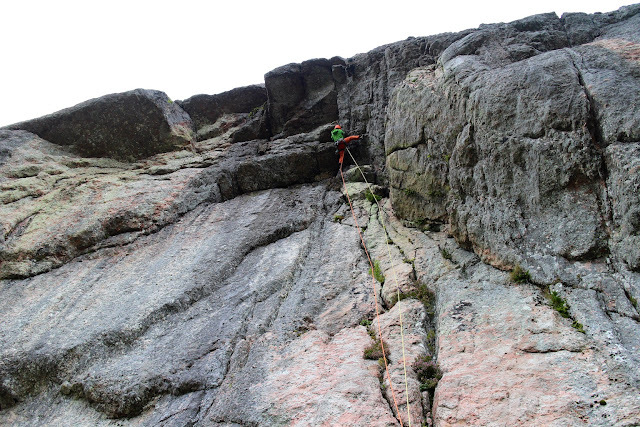 The crucial small wire placements were right in the middle of the crux sections. So placing them on lead would basically be the crux of the route. I had a bit of a cold so decided to take a rest the next day and go up on the Thursday to lead the route. On my rest day I bumped into Steve Ashworth who decided to pop up with his camera, hence the nice pictures! Next day I dropped Alicia off north of Ambleside for a long run on her Bob Graham round preparation and drove round to Wasdale, with the agreement that we would rendezvous at Scafell and I would do Return of the King. Alicia arrived just as I was having a quick warm-up shunt on the route and I got on the lead straight afterwards. I’ve only been bouldering and some winter climbing for some time now. It’s been a while since I’ve been on the sharp end on an E9. 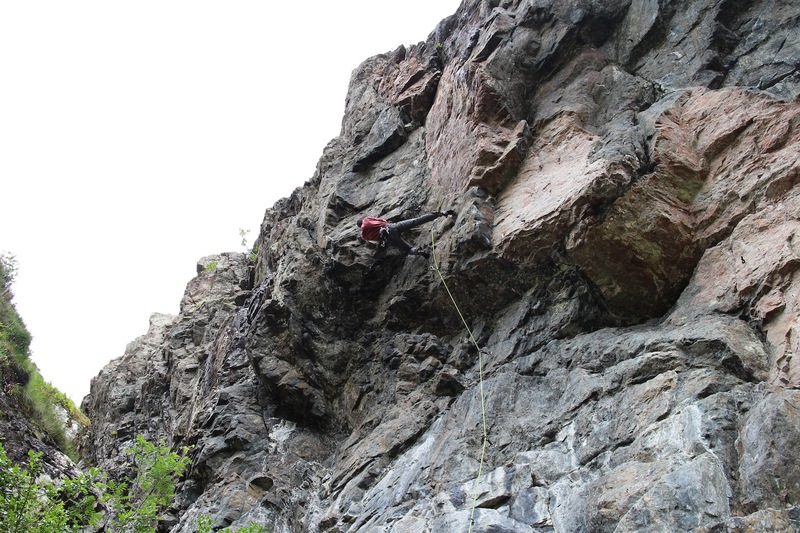 So I did feel that my normal routine of getting into a very psyched-up mindset for blasting off up a hard route with only a couple of RPs clipped to your harness. It did definitely help that I still had a bit of strength in my arms from the bouldering season. The moves of the route were feeling fine. The crux was placing the first crucial RP. I had found a heel hook that allowed me to hang the crimp long enough to get the gear in and clipped before my right arm started to melt. I have a low volume heel and found my left Muira was slightly more secure than my favourite boots (the Otaki). I only have one size of Otaki at the moment but a tighter pair would have worked just fine. The wire went in just fine although in my bubble of psyche I managed to clip the wrong rope into it which meant I had to reverse back down a move or two and sort ropes out. The rest of the pitch went really smoothly and I had plenty in the tank. Placing the second wire on the traverse left wasn’t as hard as I expected. Nice feeling to have some results from my training once again. 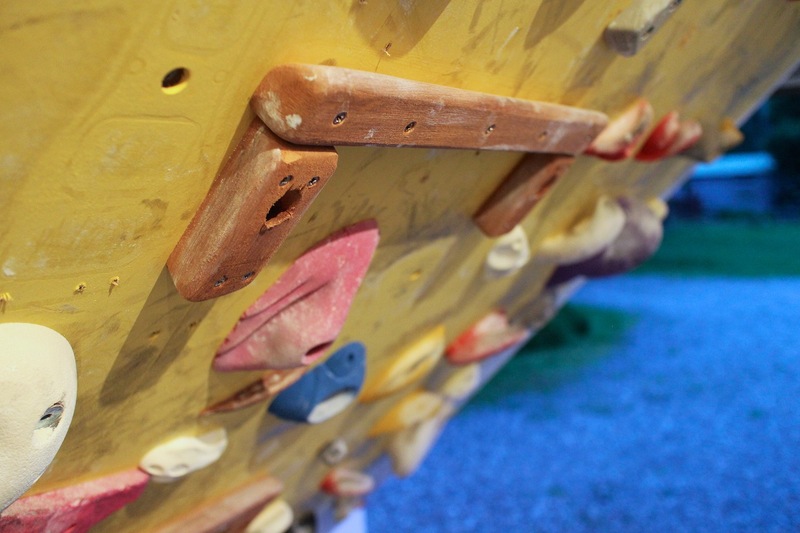 I did write a conclusion to this blog post referring to my inevitable linking of this climbing experience to the EU leave. But since I feel rather depressed right now with things outside of climbing, I deleted it. Right now, I will just get on with being alive. I’m delighted to say I have joined the athlete team of La Sportiva after meeting the guys at Lyon Equipment last week. I don’t think it is news to any readers of this blog that I am pretty obsessive about the details in pushing my climbing and in optimising every aspect of it. So if I’m obsessive about climbing gear in general, when it comes to footwear, especially rock shoes, I take it to another level. And why wouldn’t you? 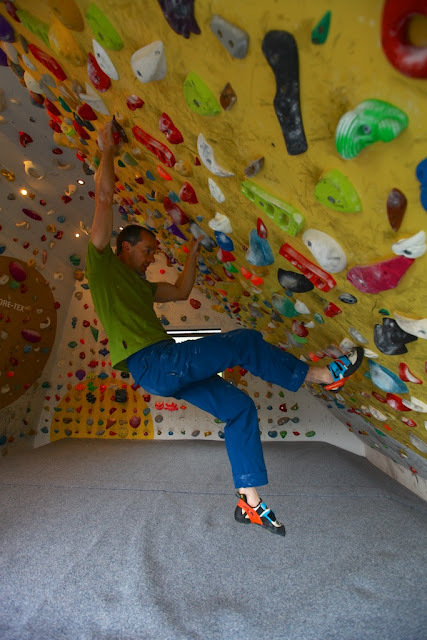 In rock climbing, the shoe on your foot becomes part of the machine. Your climbing style changes to match it. Anyone who's read 9 out of 10 and Make or Break knows my views on how important it is to get this right. But even if you follow good practice with choosing your rock shoes (trying on many pairs until you find something that fits your feet well) there is still the issue that individual models sometimes change, and your favoured model is no longer around. However, one lasting rule is that expert shoe manufacturers, with a long track record of designing and constructing high quality shoes can be relied upon to keep producing great designs. I’d been deliberating about linking up with a footwear sponsor for some time. La Sportiva was the manufacturer in my mind to speak to. I got a great delivery of La Sportiva shoes earlier this week and obviously couldn’t wait to try them out. 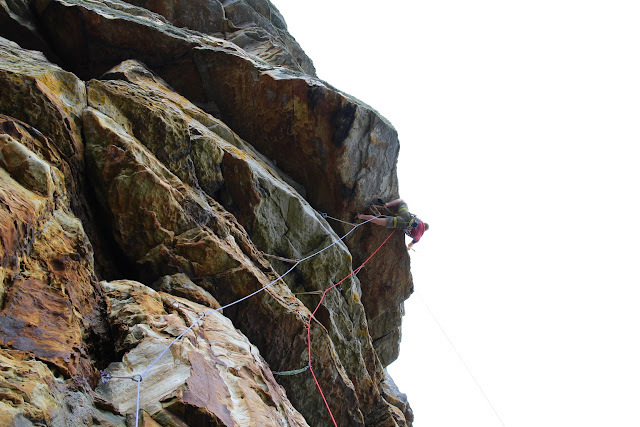 Over the past few days I’ve been climbing on very steep ground, first on a boulder project and then some sport climbing. I tend to prefer stiffer shoes than most, but I also like a good downturn. 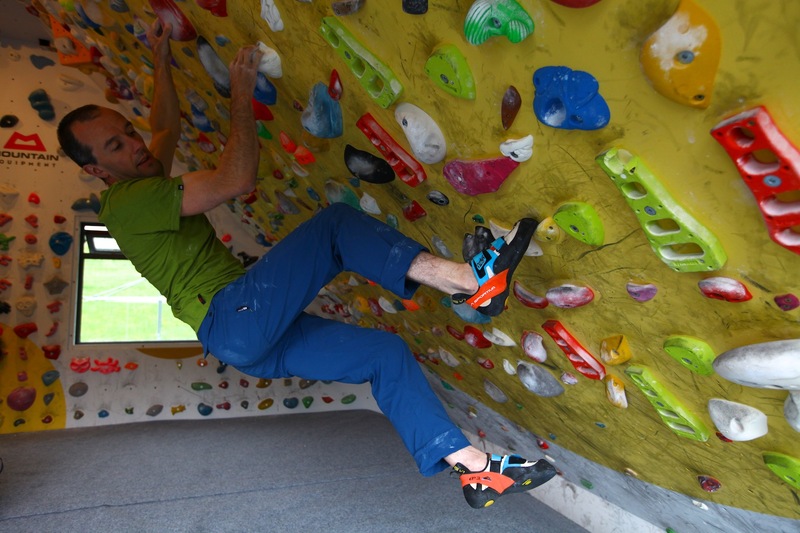 My favourite shoe so far for this type of climbing has been the new Otaki (I’m wearing in the pics) which is just out. They are brilliant for applying huge amounts of tension through a tiny foothold on steep ground and feel very compact and responsive on my feet. The overall ‘feel’ of a rock shoe definitely influences how you move on the rock and these feel secure, precise and just incredibly powerful on the vertical to 45 degree terrain I’ve climbed on them so far. Although I still didn’t quite manage the boulder project I tried on my first outing with them (it is super hard for me! ), they did feel fantastic and I could nearly do the project with some different foot beta I’d previously dismissed because I couldn’t get enough weight on my feet. 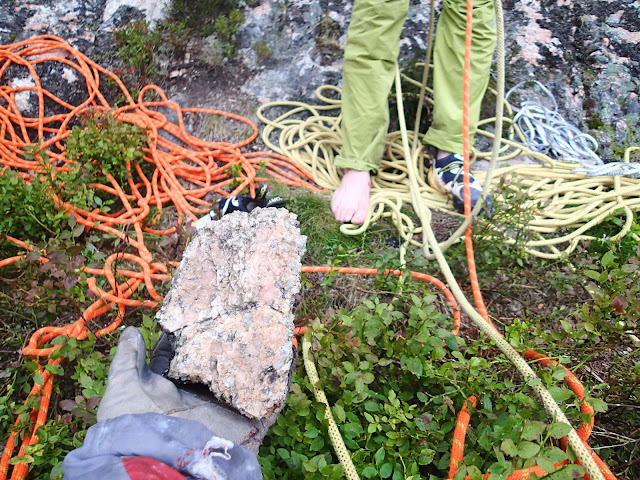 The next day I did Remember to Roll (8b at Creag nan Luch) first redpoint in them and it felt pretty easy! Pretty good start. Today I did a big training session on my board in them and they felt top notch on my entire cadre of hard problems and circuits on the 45 board. I’m always hesitant with hyperbole, but they did feel like I was getting a bit more body tension on these problems I know well than any other boot I’ve tried. You can take that with a pinch of salt since it’s a subjective comparison. But on the other hand, I know my board well, and I’m pretty sensitive to the differences between my many different rock shoes I’ve trained in over the years. Obviously I’m also looking forward to climbing in La Sportiva’s winter boots this year, especially the Batura and Ice Cube. And I also feel a little coy about getting excited about new hillwalking boots. As a Scottish climber, my hill boots live in my car and I pretty much spend my waking life in either those or my rock shoes. If they are not super light, super comfortable and keep my feet nice and dry, my life would be a lot worse. I walked into my project on Skye in my new Trangos and know I will be a happy man pounding the Scottish hills in these. The athlete team I have joined is rather humbling for me. It's quite a list. I better step up! Racing ahead of my chasing pack of midges to arrive at the roof on North by North West direct (E7 6b). From here you swing wildly left along the lip and get cracking on the big wall above. Last week I decided to teach myself the lesson for a third time that boulder project season is over. I know, I’m a slow learner. However, to be fair I still almost pulled off my project. Since then I have been trying to get my endurance off the floor. One place on my project list was The Bonaidh Donn near Torridon, not an often visited crag I don’t think. Which is a shame because although it’s quite far from the road it’s really good. There is one hard route there - an excellent sounding E7 of Stork’s called North by North West. It does a 5c first pitch and then traverses out above a roof to enter this wild finger crack soaring up an overhanging wall. I guessed a direct entry through the roof could be a good project. I went up and abseiled down for a look. Unfortunately the roof was blank. But there was obvious potential to come into the line along the lip of the roof from the right making a more direct single pitch version of the climb, probably at the same grade. I went up on a super hot day with Alicia to have a go. 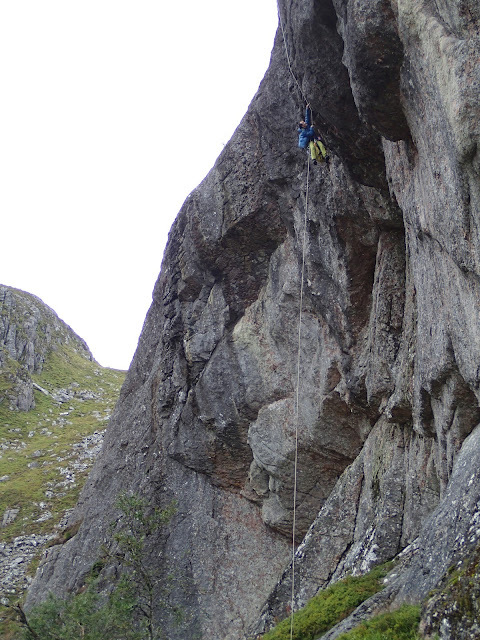 After doing some other routes the midge appeared and the conditions were ridiculously bad. We sat with our hoods on and I contemplated the futility of trying it in full midge and heat. But I just don’t like going home without the route in the bag. So we went down and I tied in. In order that I didn’t melt, I was forced to take my midge hood and long sleeve top off to start up the initial wall. This provided about E7 6c midge factor scraping tons of midges off my arms while trying to get a first runner in. Things thankfully got more breezy by the roof and I was able to immensely enjoy the rest of the route, which didn’t feel too hard. Great start to the trad season. Alicia following 'Stoater' (Severe). The wall of North by North West can be seen in the background. High on North by North West. Great line.